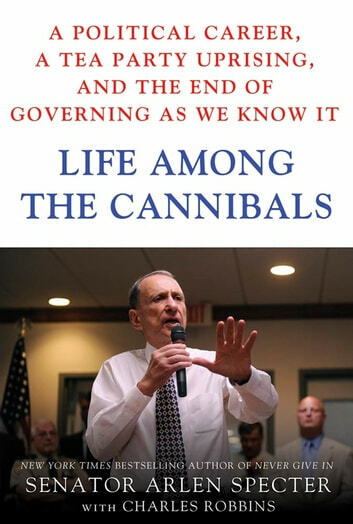 During a storied thirty-year career in the U.S. Senate, Arlen Specter rose to Judiciary Committee chairman, saved and defeated Supreme Court nominees, championed NIH funding, wrote watershed crime laws, always staying defiantly independent, "The Contrarian," as Time magazine billed him in a package of the nation's ten-best Senators. It all ended with one vote, for President Obama's stimulus, when Specter broke with Republicans to provide the margin of victory to prevent another Depression. Shunned by the GOP faithful, Specter changed parties, giving Democrats a sixty-vote supermajority and throwing Washington into a tailspin. He kept charging, taking the first bursts of Tea Party fire at public meetings on Obama's health care--reform plan. Undaunted, Specter cast the key vote for the health plan. 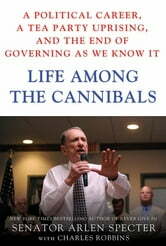 In Life Among the Cannibals, Specter candidly describes the battles that led to his party switch, his tough transition, the unexpected struggles and duplicity that he faced, and his tumultuous campaign and eventual defeat in the 2010 Pennsylvania Democratic primary. Taking us behind the scenes in the Capitol, the White House, and on the campaign trail, he shows how the rise of extremists---in both parties---has displaced tolerance with purity tests, purging centrists, and precluding moderate, bipartisan consensus.